What does the future hold for the Nato alliance? It is simplistic to compare the state of the western alliance today with what it was in 1944. Nevertheless, the D-Day celebrations provide a moment of reflection on how things are with a glance back at how they were. I attended the 50th anniversary ceremonies 10 years ago. That was when the Queen's voice cracked as she addressed thousands of British veterans lined up on Arromanches beach, the concrete hulks of the Mulberry harbour still protruding above the waves, and told them: "Veterans of the Normandy campaign, your nation salutes you." As a moment, it could not have been bettered. I thought at the time that it would, and perhaps should, be the last time the anniversary was marked by such high-level formalities and that in future it would be left to the ex-soldiers themselves. But D-Day has such a hold on the public imagination, especially in Britain and the United States, that the 60th anniversary has turned into a major event. The French also want to use it to look ahead (looking back is naturally not so great for them and they think we do it too much), so President Chirac has invited the German Chancellor, Gerhard Schroeder. Indeed the French right wing paper Le Figaro had a headline on 5 June saying that Germany had become France's best ally. The position of Germany is one major difference from 1944, of course. There is a similarity -- the US and Britain are fighting side by side, though this time in a very different conflict. Russia has also come full circle -- from ally to threat to partner. This year's commemoration has become a political fest, with all the risks that implies at the moment. How will George Bush and Jacques Chirac, who is not invited to the White House these days, get on? Does this mark, underneath the memories, a moment when the United States pauses before drawing away from Europe? There is talk in the Pentagon of the US pulling most American troops out of Europe. The old post-war status cannot go on forever. It is interesting to talk to historians and find that they are not so dewy-eyed about Anglo-American relations during the Second World War as might be expected. 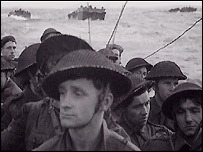 Sir Martin Gilbert, who has just published a book, simply named D-Day, pointed out that there had been differences over strategy. The Americans wanted a landing in northern France, and the British favoured continuing the campaign in Italy, which had already drawn German troops in. "The alliance had had tremendous problems, and the debate was resolved in the very difficult conference in Quebec in 1943. "Normandy was finally agreed on, even though it was accepted that it would be harder," he said. But once the decision had been taken, he went on, the integration was total. "It was amazingly harmonious. If Churchill asked to see a particular commander, he never knew if a British or American officer would turn up. "It was an incredible allied effort." Sir Max Hastings, whose own book on D-Day was named Overlord, after the invasion's codename, also takes what he calls a "realistic" view of the alliance during the war. "It is naïve to think that the US and UK found it all easy. By May 1945, Churchill's private secretary, Jock Colville, wrote in his diary about how unpopular the Americans were. "Some Britons, he felt, sympathised more with the defeated Germans." Some commentators go beyond being realistic and become almost sceptical. Dr Gary Sheffield, of King's College, London, said: "The alliance with America was a historical accident. Britain had traditionally been allied to France but that ended with the French defeat in 1940. "There has never been a permanent alliance in history. The Second World War was an alliance for survival, but no alliance is for ever." 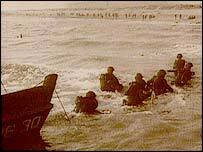 The D-Day events will inevitably attract comment that the alliance today is in trouble. The Cold War has taken away Nato's original raison d'etre and Iraq has divided its ranks. 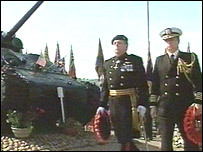 Professor Brian Bond, of King's College, has been critical of Nato for years. "At present it is a rather uneasy political alliance with no underpinning. The Second World War was a real alliance, born of necessity," he said. "With the end of the Soviet Union, there are still evils in the world but they are less tangible. And because of Iraq, transatlantic relations are near their worst. "The next year will tell if they improve or whether the alliance will split up." An alternative to the transatlantic alliance is a closer European alliance. The proposed European constitution allows for an eventual defence policy by the European Union. In a cynical world, no nation can go it alone. Max Hastings says that Europe is not doing enough. "There are some real doubts about the relationship with America and whether Britain should rethink its historical ties, especially if the US behaves in an ill-advised way. "But Europe is not taking defence seriously. Even those of us who are dismayed at the way the Americans have handled Iraq cannot pretend there is an alternative," he said. "The Americans are not the only game in town. They are the only game on earth." The likelihood is that Nato will stagger on for the foreseeable future. From being an almost entirely defensive organisation facing a single known enemy, it has become interventionist around the world. It is leading operations in Afghanistan, for example and fought the war against Serbia for Kosovo. With new transport planes on order by Britain, France and Germany, European members will soon have greater ability to take troops to distant spots. If you have the capability, you often use it. The longer-term question is over the relationship with the United States. Sir Martin Gilbert's view is that "in a cynical world, no nation can go it alone". "World War Two was absolutely unique," he said. "But without alliances, you are nowhere."